Tony Benn died a national treasure. An impressive achievement for a radically left-wing politician who spent much of his parliamentary career demonised by the press. But, when all's said and done, what did Benn actually achieve? His brand of democratic socialism stood starkly at odds with the now dominant free market philosophy of Thatcher and her ideological children. At the end of Benn's life, with David Cameron's government openly preying on the vulnerable and portioning off the state to his chums, did he feel like he'd failed? Benn's Last Tape explores that through a sideways reinterpretation of Beckett's Krapp's Last Tape. We find Benn (Philip Bretherton) recording what he intends to be the final instalment of his exhaustive diaries. Surrounded by piles of books (almost all about him) he sits in a dressing gown and 'STOP THE POLL TAX' t-shirt sipping from a gigantic 'HP sauce' branded mug, snugly fitting into a space that feels like an extension of his personality. The one man play is a rambling monologue that covers every major part in Benn's life; his personal life, his experiences in World War II, his ministerial philosophies for energy and technology, assessment of political developments, his health, trips to Russia and China and the legacy that he's leaving. Vibrating under all that is an undimmed sense of socialist indignation, even as his candle flickers he's able to summon up the booming rhetoric that 'shook the plaster' of Union halls, party conferences and protest marches. I saw Benn speak a number of times, and Bretherton's mimicry is often uncanny. Sat in the front row I can practically feel my hair being rustled by the force of powerful speeches, underpinned by rock-solid political conviction. Thing is, it's one thing to see the man himself give a speech to a receptive, cheering audience and quite another to see a rather frail, bathrobe wearing old man ranting to an empty room. Gradually we understand that his invective is directed inwards, Benn trying his hardest to convince himself of his own importance. For all his fire and passion Benn's political career was ultimately one of noble failure. From the electoral (but not philosophical!) disaster of the 1983 Labour manifesto, to the privatisation of the industries he sought to keep state-owned, to his futile campaign to stop the Iraq War, to (more broadly), his vision of Britain as a socialist-democratic worker's utopia - all came to naught. Even his successes like overseeing the development of Concorde were gradually dismantled. It's telling that it was only when he was at his most politically powerless that he reached the heights of popularity. Bretherton's Benn is pleasant enough company in a curmudgeonly sort of way, yet he's battling a deep sense of frustration and suspicions of worthlessness. This knits Benn with Beckett's Krapp. Very quickly, we realise a weird synchronisation between fiction and reality has taken place. Krapp, like Benn, records his thoughts onto tape, endlessly rewinding and replaying in order to gain ever-elusive perspective. The two characters also share a love of bananas. Bananas aside, the two characters thematically fuse together too. Krapp, like Benn, desired to change the world (Krapp with art, Benn with politics), yet the thrust of Krapp's Last Tape is how confidence and certainty are eroded by doubt. The endpoint is the nihilistic conclusion that the world will trundle on the same as ever and all his efforts have amounted to zilch. Krapp and Benn are both men possessed of vision, but Beckett's conclusion is that his character wasted his life in pursuit of the unattainable. Fortunately, Tony's Last Tape isn't quite as doomy. Writer Andy Barrett is clearly a fan of Tony Benn, his script possessing an obsessive level of knowledge about the man's life. To end a play about the recently deceased Benn on as cynical a note as Beckett does with Krapp would leave a bad taste in the mouth. So it's nice that, even in the midst of failing health and relevance, Barrett allows his Benn to go out on a note of triumph, albeit a muted one. For those of a political bent Benn's Last Tape is catnip; working as a dual study of Benn and an overview of postwar British politics. 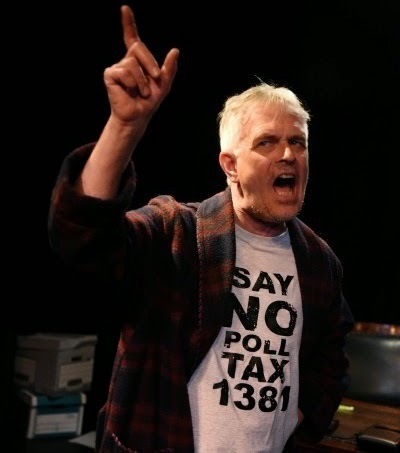 For old socialists in the crowd, Bretherton's passionate oratory will stir the blood, his excellent performance more than doing credit to the memory of Tony Benn. The flipside is that anyone unfamiliar with recent political history will find themselves lost in a morass of obscure references and namedrops. I'd like to consider myself pretty up on this stuff, but even I had the odd moment of confusion trying to pick through the intricacies of internal Labour squabblings in the 60s and 70s. But on the whole I had a wonderful time. At 75 minutes the show is nicely pacey and surprisingly dynamic given the single-setting and age of the lead character. Well worth a trip down to the depths of Penge West. Benn's Last Tape is at the Bridge House Theatre until 17th May. Tickets here.